Although I have been to several exhibitions throughout the Summer in New York, I really wanted to go to one in London. My friend Tom and I (who is on the same course as me) really wanted to see the Audrey Hepburn Exhibition in the National Portrait Gallery, as it was spoken very highly upon. Neither of us really knew much about Audrey Hepburn and to me it was an extremely insightful exhibition. 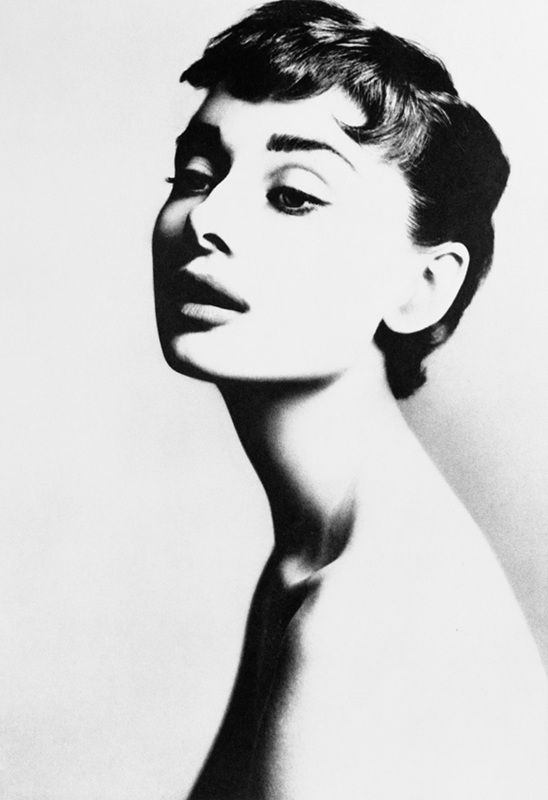 Within the exhibition “Portraits of an Icon Audrey Hepburn” they categorised her main time line of events into four sections. These sections covered Audrey's Childhood and Early British Success (1929-1952), American Stage and Film (1951-1960), Film and Fashion Portraits (1960’s) and Legacy and Later Years (1971-1993). Audrey's sons Sean Hepburn Ferrer and Luca Dotti granted researched into the family background to help create this exhibition. I thoroughly enjoyed the exhibition, however, it was a lot smaller than I anticipated. All of the photographs were rather small and squeezed into three confined rooms and I was left reeling to see more! Due to the fact it was a small exhibition, the amount of people crammed into one viewing did make you feel a little rushed to get around it. This made me feel like I didn't have time to appreciate the sheer beauty and art work in front of me at times. I'm not sure if it was just our time slot, but there were several people who decided to bring their several week/month year old babies to the exhibition, which again was a little distracting when you were trying to take in the information and meaning of each image. This photo above was produced by Jack Cardiff during the filming of 'War and Peace' (1956). What I particularly love about this image is that it is so honest, you don't need props and gimmicks to create a powerful and poignant photograph. The use of light and shade itself helps to create the story. It appears the light signifies hope at the end of the darkness they had to experience throughout the war. I could be wrong, but this was my interpretation on what I found a very powerful image. 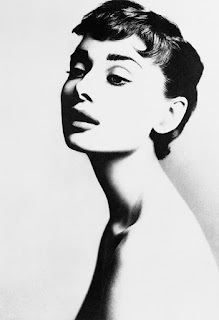 This image above was taken by Richard Avedon in 1953. Again, the light and shade within this photograph in my opinion is just spot on. I believe there is something so special by being able to create and develop your own prints in the darkroom. By having that control over whether you over expose the image and accompany it with a high level of contrast, enables to make the person (in this case Audrey) pop out of the background and keep your eye completely focused on them the whole time. Although I enjoyed viewing the colour renditions of Audrey's Hepburn's life, I personally have a love for black and white/film photography. I felt this image out of the whole exhibition summed up Audrey's life up perfectly. For instance, the expression on her face and the pose presented, appears to recall her joyful childhood, whilst the equipment in the background invites the viewers to reflect on the life she has lived in front of the camera (throughout the many years of acting and modelling).